helmets to find. Don't know how often they were available, but they were given out at a Reds game August 6, 1961. What is the writing in the center of his C? Is it the word "Reds", or is it just his number? Thoughts: Kind of a rare helmet. I haven't seen that many of these floating around out there. I don't think the Reds have ever worn this helmet, let alone a hat like this. Thoughts: Just a neat helmet where they still had a real sticker instead of a screen printing. Thoughts: This helmet stayed with the Reds forever an epitomized the Big Red Machine of the 1970's. 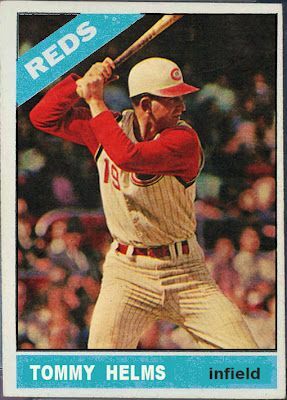 Now, I'm not really for sure when the Reds changed the letter "C" logo on their helmet so your guess is as good as mine. billed" helmets that I mention from time to time. the helmets above you will notice the difference. Eric Davis, where have you gone? Thoughts: A change of uniforms with a little bit of black added in. Sean Casey comes to my mind in this helmet. Griffey Jr. will finish his career in this helmet. To bad that health problems have taken away from his game. Thoughts: A more up to date version with the small black outline of the "C."
Thoughts: Just a Coolflo version of the real thing. This was a promotional giveaway. giveaway helmet. Don't confuse this one for the one at the top of this page because I have seen it done. Dates used: Good question. . . Thoughts: Okay, what's up in this photo? 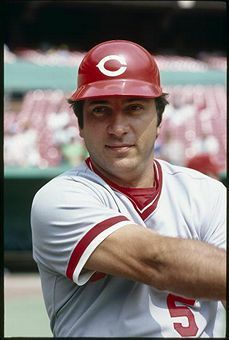 The Reds actually wore this helmet during spring training games in 1983. I actually just took a helmet like the one above and with a lot of elbow grease and a bottle of Oops!, I removed the red bill paint job. Not bad, huh?